Most people who visit the Czech Republic focus on Prague. Prague is such a beautiful city that it makes a great city trip for a weekend or a week, and no wonder: the old city of Prague is the most important of the UNESCO sites in the Czech Republic. 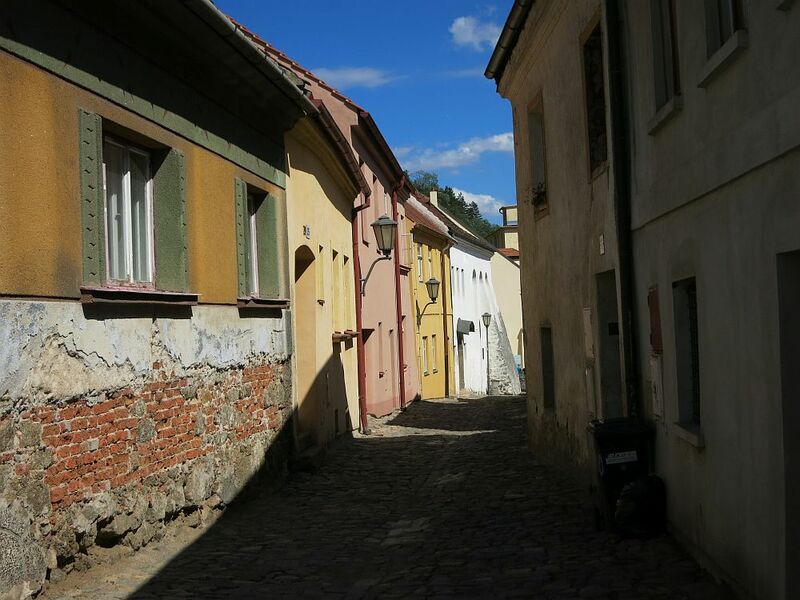 Prague’s Jewish Quarter is a part of the old city that I’ve written about before. Below I describe each of the sites. I’ve written separate articles about some of them, and added the links for you to read more if you want. At the end of this article I’ve included information for visiting each: hours, prices, etc. 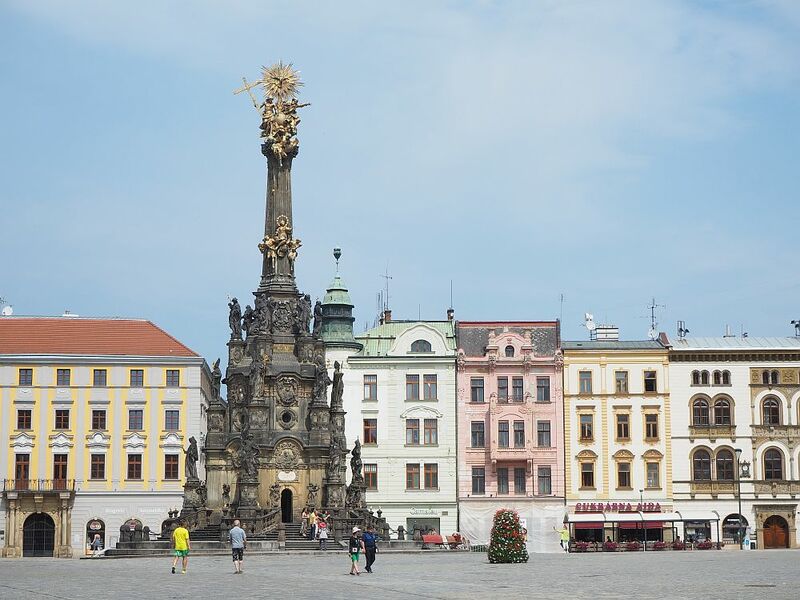 The UNESCO site in Olomouc is really just a single structure: the Holy Trinity Column, which sits in the central town square. You’ll see decorative columns like this in many village and town squares in the region, but this Baroque masterpiece is unique because of its size (32+ meters) and the ornate and skillful sculptures that cover it. Dating to the 18th century, it serves no purpose other than as a statement of faith. Several Moravian artists contributed to it. Unlike most such columns, this one is large enough to have a small chapel inside. The Holy Trinity Column in Olomouc Upper Square is a UNESCO site in the Czech Republic. To read more about visiting Olomouc, check out my post A UNESCO site in Olomouc (and other things to see there). I’ve written about Brno before, after an earlier visit. That time, I visited three sites that are not UNESCO sites but that were very interesting, if not a little macabre: an ossuary, a crypt complete with mummies, and a nuclear bomb shelter. What I didn’t do was visit Brno’s UNESCO site: Villa Tugendhat. In a way, I still haven’t. I hadn’t booked a ticket ahead, and all that day’s tours were full. Nevertheless, I could pay admission to the garden, and got a bit of a look inside through the windows. Villa Tugendhat was designed by Mies van der Rohe in 1929-1930, commissioned by Fritz and Greta Tugendhat. Van der Rohe was director of the Bauhaus school in Germany, but his style was not well-liked by the Nazis. 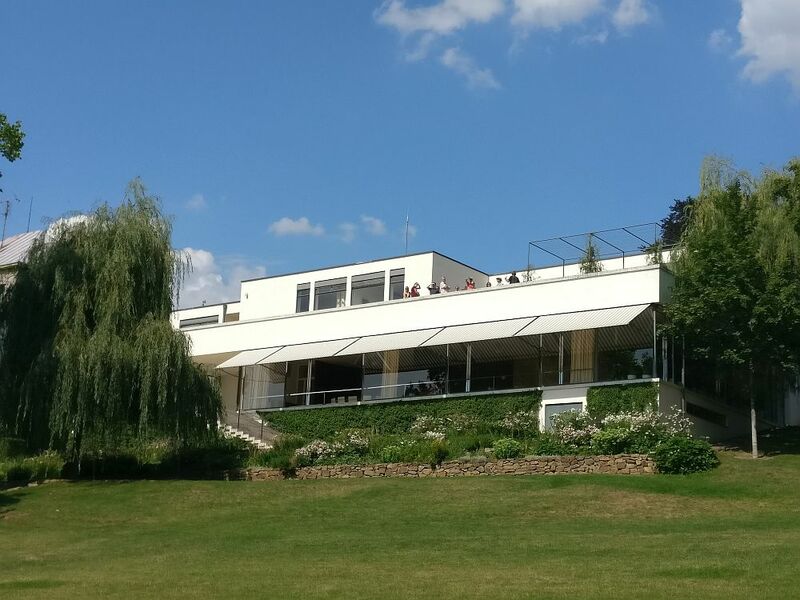 Villa Tugendhat was one of van der Rohe’s earliest modern functionalist designs. Villa Tugendhat as seen from the back garden. It sits mostly below the street level, so there isn’t much to see in the front. The building is unusual in that its iron construction allowed huge plate-glass windows and large open spaces. One wall inside is made of onyx that is, apparently, translucent in some lights. 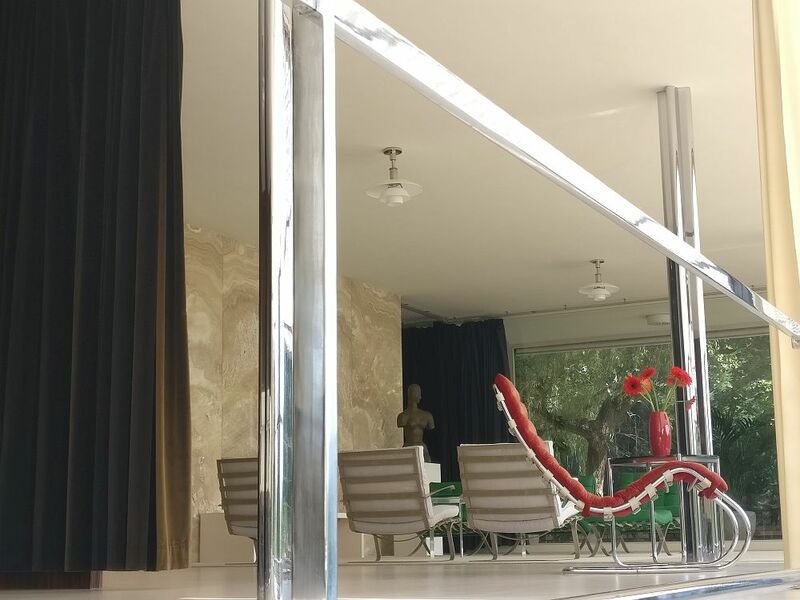 Mies van der Rohe also designed the furniture of Villa Tugendhat. In this shot, taken from outside looking in, you can see some classic pieces. The Tugendhat family, German Jews, only got to live in the villa for a few years, fleeing to Switzerland in 1938. It was used by the Gestapo during the war and was damaged toward the end of the war. Afterwards, the Soviet army used it. Later it went through a number of other uses. Eventually it was renovated and is now a museum, run by the city of Brno. 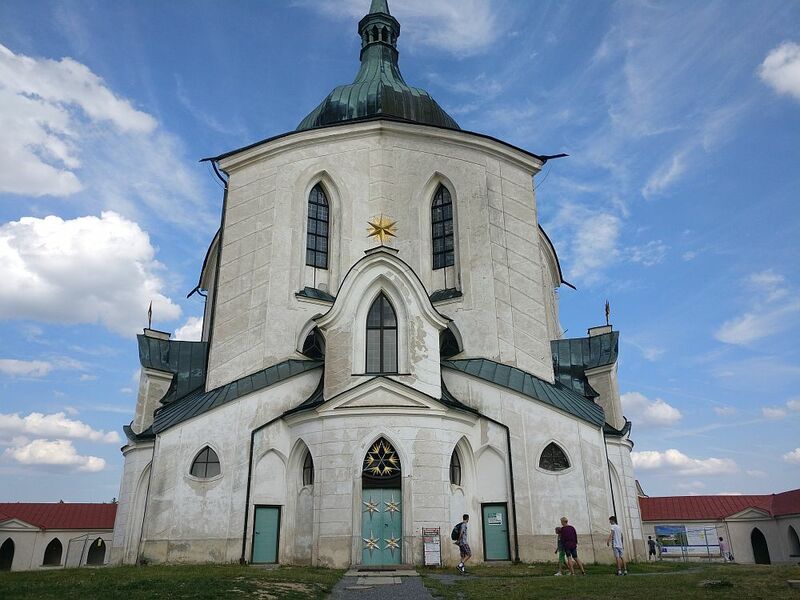 This unusual church near Žďár nad Sázavou is UNESCO-listed because of its exceptional architecture. Built in the early 18th century, designed by Jan Blazej Santini, its style, according to the UNESCO site, “falls between neo-Gothic and Baroque”. The church is a tall, blockish building as seen from ground level, but what stands out most is the star-shaped cloister around it. 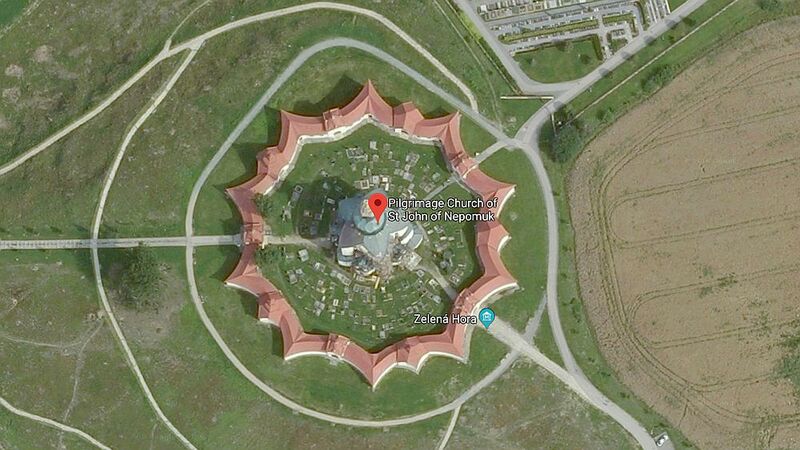 This view, thanks to Google maps, shows the unusual shape of the cloisters surrounding the church. What you can’t see from either of these pictures is how impressive and imposing this church’s location makes it. It tops a hill with no other nearby buildings. A particular “wow moment” for me was my first sight of Telč’s main square. Lined with lovely rows of pastel-painted houses, the cobblestone square just oozes charm. The houses, built in the Middle Ages but renovated since then, now have Renaissance and Baroque-style facades. Each one is different from the next. An arcade connects them all, allowing shoppers (most of the ground floors are now shops) to stay sheltered. Just some of the houses lining the main square of Telč, a UNESCO site in Czechia. If you look closely, you’ll see that some of them are covered in sgraffito, which is a style of painting using colored plaster rather than paint. Or they are painted in a trompe l’oeil style. 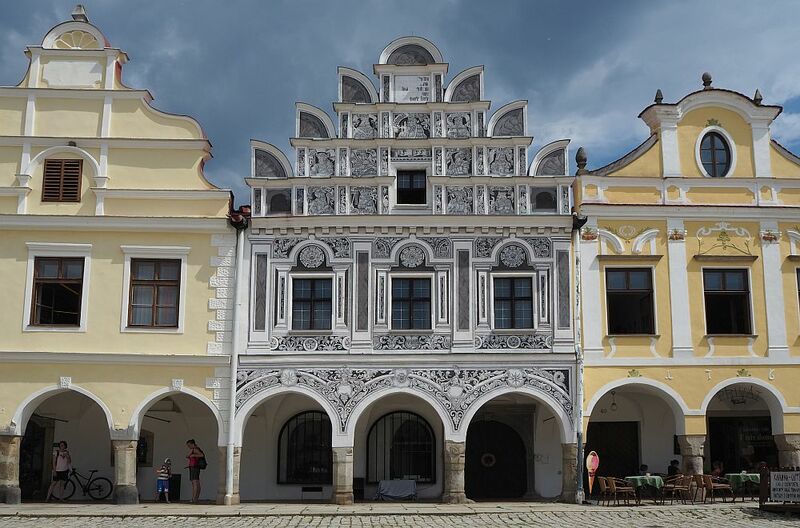 One of the more ornate houses on Telč main square, this one is deceptive in that what looks like sculptural decoration is actually painted. If you go to Telč, make sure to climb the tower of St. James’ Church, at the narrow end of the main square, to get a look at the town from above. Street view in the Jewish Quarter of Třebíč. The white building down the street is the synagogue that is open for visitors. To read more about Třebíč, see What to see in Trebic, Czech Republic: A UNESCO site. Kutná Hora is probably the most visited of these UNESCO sites in the Czech Republic because it’s so close to Prague: an hour or so by car and two hours by train. The UNESCO site comprises the old town center and two churches: the Church of St Barbara and the Cathedral of Our Lady at Sedlec. The old town of Kutná Hora has not changed in structure from its medieval roots, and many buildings – including private homes that demonstrate the prosperity that came from the silver-mining industry that flourished here – still show their Gothic or Baroque origins. 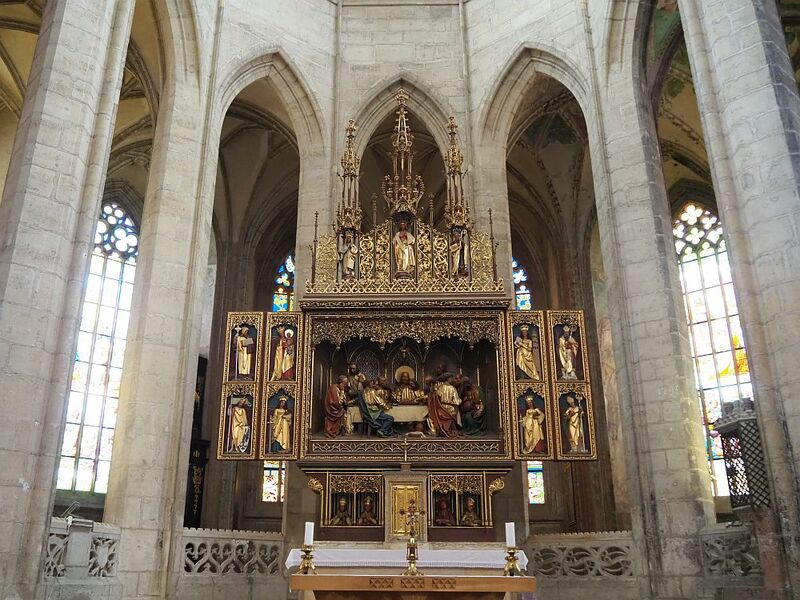 To read about the two churches and another truly macabre church in Kutná Hora, read my article Kutna Hora UNESCO site and a macabre church. 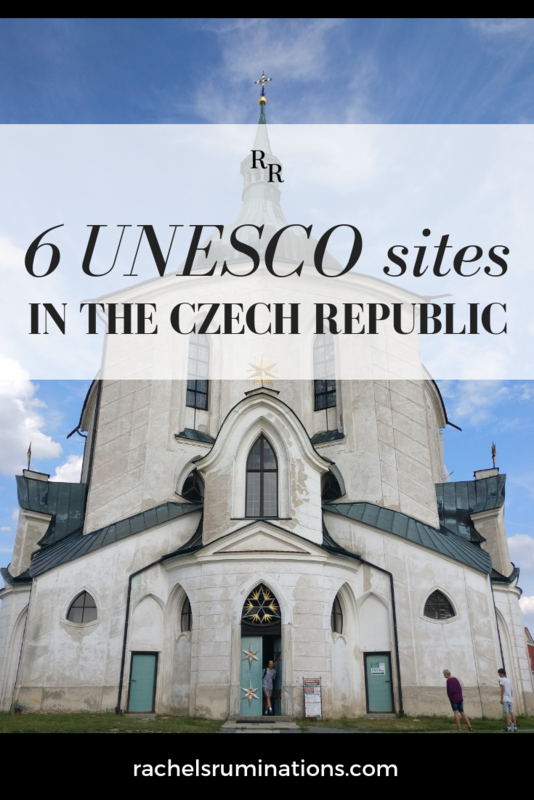 The easiest way to see these UNESCO sites in the Czech Republic would be by car, since they’re all quite scattered. Don’t do what I did, though, and rush this trip. I was on my way from Ostrava to Prague, and I only had two days before my flight. In those two days, I tried to see all of these sights except Třebíč, which I saw last year on my way back from Romania. First of all, the driving will take some time, though the main highways are well-marked and well-maintained. Secondly, all of these places had additional sights worth seeing, especially Kutná Hora, Olomouc and Telč, and I would have liked more time to see them all well. It’s easier, of course, to take a tour. These tours combine some, but not all, of these UNESCO sites in the Czech Republic. See my separate article about Olomouc for travel information. Villa Tugendhat is on Černopolní 45 in Brno: an upscale residential neighborhood. It’s a half-hour walk from the train station or you can take tram 9 to Tomanova stop and walk up Tomanova to cut the walking to about 10 minutes. Hours: Tuesday to Sunday 10:00-18:00. You can only tour the inside with a guided tour, which you should book several months in advance via their website. Admission: The basic tour (just the first and second floors and the garden) is CZK 300 (€12/$14) and takes about an hour. The extended tour adds the technical room on the ground floor where all the machinery is. It takes an hour and a half and costs CZK 350 (€14/$16). To see only the garden, as I did, costs CZK 50 (€2/$2.50). If you don’t have a car, you can take a train to Žďár nad Sázavou. From Prague it’ll take about 2½ hours and from Brno about 1¼ hour. You can walk up to the church or take a bus. Hours: In April and October: Saturday, Sunday and holidays 9:00-17:00. May through September: 9-17:00 daily. The last tour starts at 16:00. 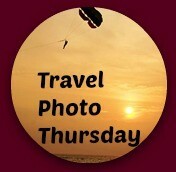 The rest of the year, if you are with a group, you might be able to book a tour in advance. The church is only open for guided tours, which take about 45 minutes. 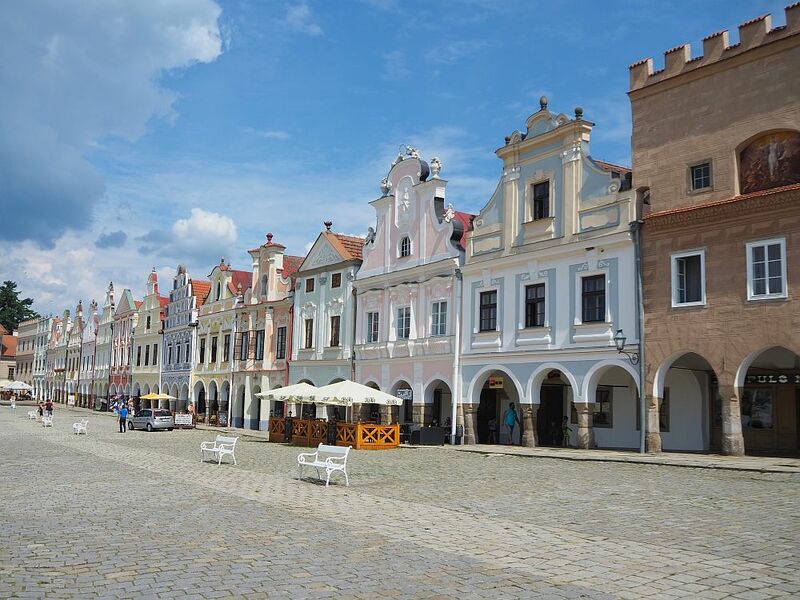 You can wander the main square of Telc anytime you want. St. James Church tower is open May and September just on Saturday and Sunday 12:00-17:00; in June Tuesday-Saturday 10:00-12:00 and 13:00-17:00 and Sunday 13:00-17:00; in July and August Tuesday-Saturday 10:00-12:00 and 13:00-18:00 and on Sunday 13:00-18:00. The tower may close in bad weather. See my article on Trebic for travel information. See my post on Kutná Hora for travel information. And please help me by sharing this post far and wide on social media! Links and pins below! Prague and the whole of CR is seriously on our list. I love central Europe such a lot. Got such a deep soul. We spent a month in the Czech Republic and did not have time to visit these areas. It is such a beautiful country with so much to see and do. We will have to return to see more.